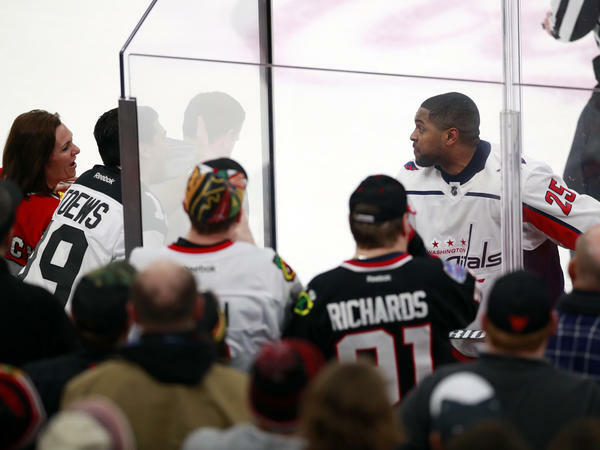 Washington Capitals right wing Devante Smith-Pelly (25) approaches Chicago Blackhawks fans who were racially taunting him during a game in Chicago. Washington Capitals forward Devante Smith-Pelly was in the penalty box after a third period fight with a Blackhawks defenseman on Saturday night in Chicago when four Blackhawks fans started taunting him in unison. "Basketball, basketball, basketball," they chanted. "It's pretty obvious what that means," Smith-Pelly said on Sunday. "It's not a secret." The nonsecret racial stereotype at play here is that basketball is a "black" sport and hockey is for white people. Smith-Pelly approached the fans who were almost directly beside him with his stick raised. The fans were removed quickly, and the Blackhawks apologized to Smith-Pelly and the Capitals in a statement. "These actions will never be tolerated," the Blackhawks said. "This has happened [to me] in hockey before," Smith-Pelly said on Sunday. "It's disgusting, that in 2018 we're still talking about the same thing, over and over. It's sad that athletes like myself, 30, 40 years ago were standing in the same place." "You think there'd be some sort of change or progression," he continued, adding that he had heard cries of "Go back to playing basketball" as a younger player. Smith-Pelly is one of about 30 black players in the NHL, according to ESPN. The league designated February as "Hockey Is for Everyone" month to promote a positive and inclusive environment for everyone in the sport regardless of "race, color, religion, national origin, gender, disability, sexual orientation and socio-economic status." The Blackhawks, who take their name from a Sauk chief and whose logo is an image of a Native person, held their "Hockey Is For Everyone" home game on Thursday, days before the taunts. "There's absolutely no place in the game of hockey or in our country for racism," said Capitals coach Barry Trotz on Saturday night. Blackhawks coach Joel Quenneville said he apologized to Trotz after the game. On Sunday, NHL commissioner Gary Bettman released a statement that said the league "condemns this unacceptable and reprehensible behavior." "We've all heard a so-called 'positive' stereotype: black people are good at basketball..." Kumari Devarajan wrote for NPR's Code Switch last week. "Once you buy that there's a connection between race and ability, it's a slippery slope to the bad stuff: black people are lazy, Jewish people are cheap," Devarajan continued. "We're at a time where we can't push this under the rug anymore," Smith-Pelly said on Sunday.